The Côte d’Azur (French Riviera) is a wonderful playground for old and young alike. Perhaps more well-known for its glamorous hedonistic lifestyle than for child-friendly vacations, this list should help dispel that myth. 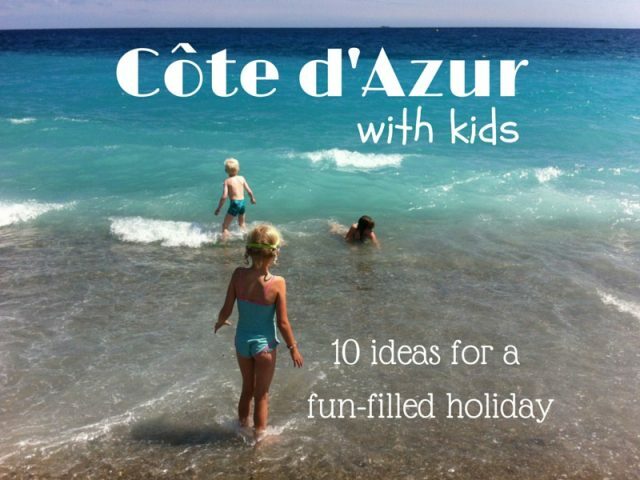 Here are ideas for top 10 things to do with children on the Côte d’Azur – great days out and activities for kids, perfect for holiday-makers and residents alike. This list is based on my experiences with my boys, it’s in no particular order and doesn’t include the obvious and many attractions of all the nearby beaches on the Riviera. Musée Océanographique de Monaco. This world-class oceanography museum sits spectacularly placed on the cliff face looking out to sea on the rock of Monaco. This in itself is worth the journey but perhaps not for the younger members of the family. For them there’s an excellent aquarium – not big but perfectly sized for young children – with a touch pool and times to observe the fish being fed. The museum is stuffed full of marine world curiosities. Again, it’s not so big that kids lose interest, but just full enough of oddities to capture their imagination. You’ll find a whale skeleton and an enormous polar bear alongside 200 year old diving gear and all sorts of pickled sea monsters! The roof terrace has a restaurant and excellent play area next to a turtle enclosure all with 360° panoramic views of Monaco and the Mediterranean. 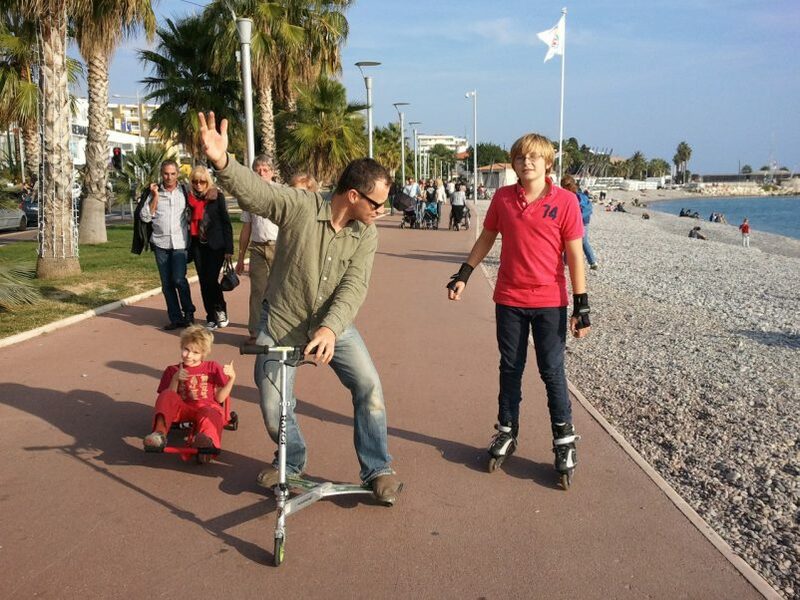 Rollerblading/cycling along the seafront at Cagnes sur Mer. Click here to see the post dedicated to this activity. Of course this can also be done on the Promenade des Anglais in Nice too. You can hire bikes in both places. Le Village des Fous is a unique theme park consisting of a “crazy village” and a labyrinth that you have to get through in order to access the village. In the labyrinth not only do you have to find your way through but there are also physical challenges at each stage. Once you’ve made it through the maze the “crazy village” awaits! (It is possible to by-pass the maze and go direct to the crazy village if that appeals more). This is a fun park with original rides such as pedal karts, a flying bath tub, water catapults, crazy mirrors, water slides, rope walks in the trees, toboggans in giant tires, water jets and much more. You can take a picnic or eat at the café. The maze gets very hot in high season but there are plenty of drinking fountains and areas where you can cool off in water spray making it perfectly bearable even on the hottest day. In summer be sure to pack the kids’ swim stuff & towels (and plenty of sunscreen). Parc Phoenix, 7 hectares of exotic gardens with 2500 plant species and one of the biggest glass-houses in Europe located on the western edge of Nice. The pyramid-shaped glass-house has 6 different climatic zones offering the visitor a rich, colourful, steamy, tropical experience. Kids love the enormous exotic plants that look like they’re out of a cartoon they’re so bright and wacky, and they just adore the iguanas wandering around freely! You’ll find a number of animals such as otters, wallabies, crocodiles, marmoset monkeys, lemurs, flamingos, kookaburras and other birds living in sympathetically designed enclosures and several excellent play areas. The whole place is beautifully landscaped and designed for a fun and fascinating day out. Picnics are allowed and there is a small café too. 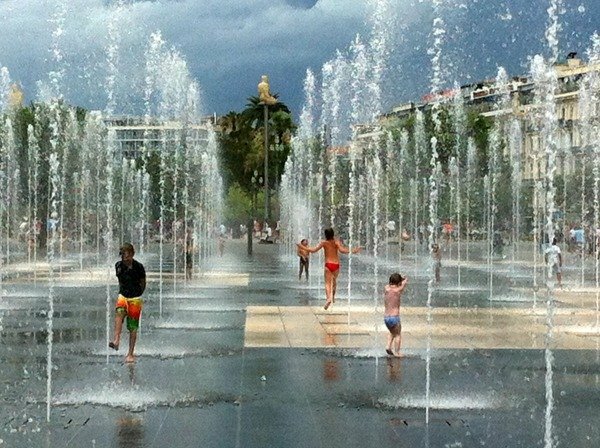 Take the Mini Train (tourist train on wheels) around Nice and then wander along the Promenade du Paillon through the water jets to the excellent children’s playground. This will appeal to younger children as it’s a relaxing way to see some of the old town of Nice and its famous seafront boulevard the “Promenade des Anglais”, followed by a fun play. In summer kids strip off to their underwear (or put on swimsuits) to play in the fountains (so be prepared and bring a towel). The playground is great at any time of year. Aquasplash, don’t all kids (big and small) love a water park? 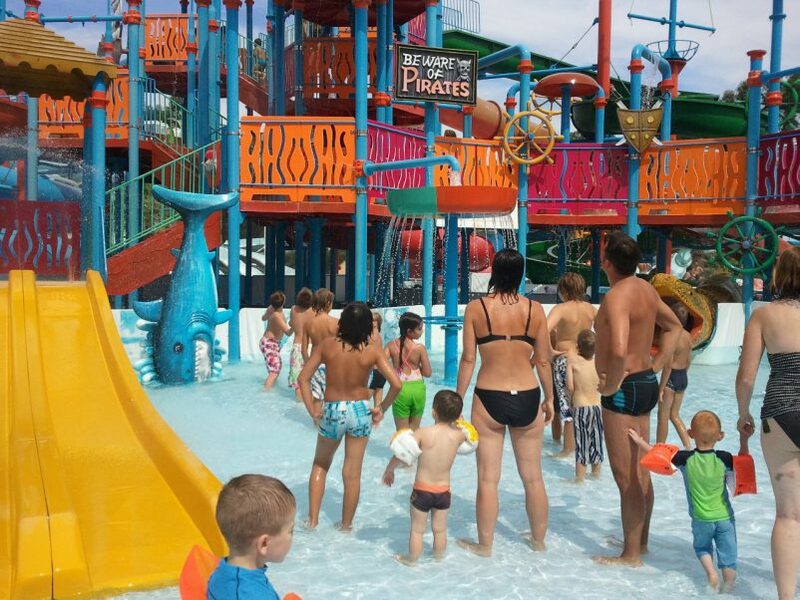 A vast choice of waterslides, some not for the faint-hearted, and a pirate playzone for the littlies make this a fun day out. It can get very crowded in high season so my advice is to get there as it opens. You’re not supposed to take picnics but you can get away with it if you’re discreet (I always do). Pitchoun Forest, zip-line adventure course in the trees (in the style of “Go Ape” in the UK). There are 4 different courses for different levels of difficulty consisting of rope ladders, zip wires, rope bridges, wooden tunnels, trapezes and swings but none of them are very high up making them suitable for as young as 3 years old (or 1m high) and up to about 9. Adults can walk around the course alongside the children to assist if necessary. Unlike in places designed for older users, the children are permanently attached to the wires; another reason why it’s suitable for such young kids. You can take your own picnic or eat in the café at the Village des Fous next door. For older kids there’s a more challenging course a couple of kilometres away at Canyon Forest (find out more here). Ferry ride to Ile Sainte Marguerite from Cannes followed by a walk along la Croisette to find the stars’ handprints. Everybody loves a boat ride, right? The ferry across to the island of Sainte Marguerite takes 15 minutes, just long enough to get salt spray on your face but not feel sick! The island itself is home to a 17th century fort where the man in the iron mask was imprisoned, a bird reserve, beautiful rocky coves and majestic umbrella pines all linked by shady walking paths suitable for pushchairs. There is a restaurant and a snack bar (not always open, depends on the season) but this is the perfect place to take a picnic and spend a day on your own little beach, paddling, rock pooling or swimming away from the crowded beaches along the coast. Once back in Cannes, if you have the energy stroll along the famous Croisette seafront boulevard, eating ice-creams and search for the hand-print of the pink panther (I think that should be paw print!) 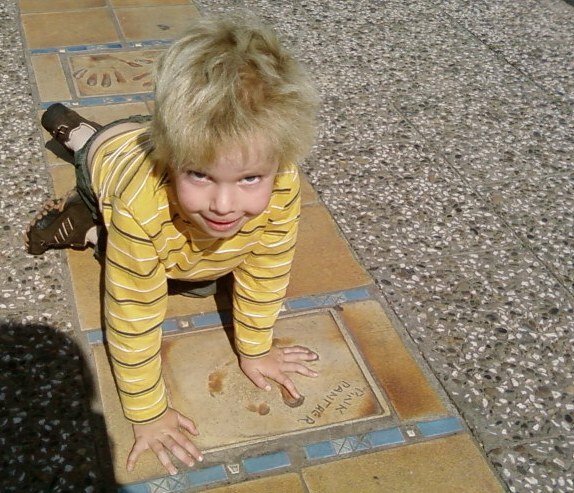 Film stars have had their handprints immortalised around the Palais des Festivals where the Cannes Film Festival takes place every year and amongst them, if you look carefully, you’ll find the famous feline. Marineland, the biggest marine life theme park in Europe with dolphin, orca & seal shows, sharks, rays, penguins and polar bears. I hesitated whether to include this as it’s not my kind of thing at all, I don’t like seeing large marine animals in captivity. *** It can get very crowded so once again my tip is to arrive as it opens in the morning and prepare your visit ahead, checking the times of the various shows so as not to miss out. It is possible to take your own picnic or eat at one of the many cafés and restaurants. 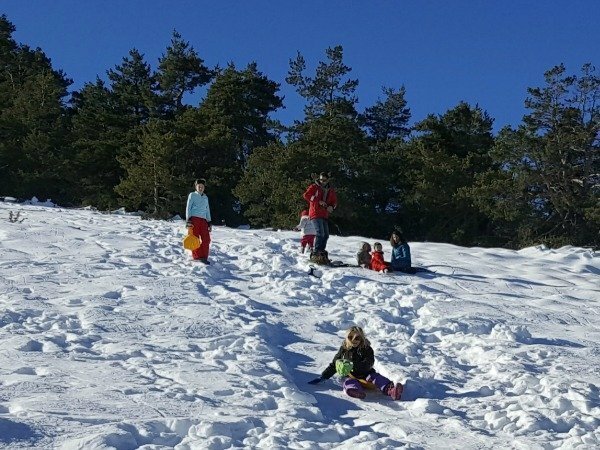 From December to April (roughly, depending on the weather) the Côte d’Azur can be the base for days out to nearby ski resorts, for skiing, sledging, making snowmen or igloos and general fun in the snow. When the snow is plentiful it’s only about a 30 minute drive into the mountains to find snow deep enough to play in. The nearest ski resort to Lou Messugo with lifts, equipment hire shops, cafés etc is Gréolières les Neiges (50 mins). Find out more about skiing on the Riviera here. All of these are within 30 mins of Lou Messugo gîte with the exception of Monaco at 1 hour. Many are only 10-15 mins away. I’ve also written about things to do with young teens on the Côte d’Azur, ideas for rainy days on the Côte d’Azur, activities with toddlers and top indoor activities (all of which can be done when the sun shines too!) Have you been on holiday in the South of France? Do you have any favourite things to add to my list? *** UPDATE 2016 Since devastating floods destroyed parts of Marineland killing an orca and many other captive fish and animals in October 2015, I have revised my opinion of this place and no longer endorse it. Personally I won’t visit again. What a great list, it all looks fantastic. I love Iguanas and would have to be dragged away from them. The water parks and water play also look wonderful. How sad about the marine park. A few years ago we went to one inthe Netherlands that I had fond memories of as a child and all I can say is, never again. Thanks for this. 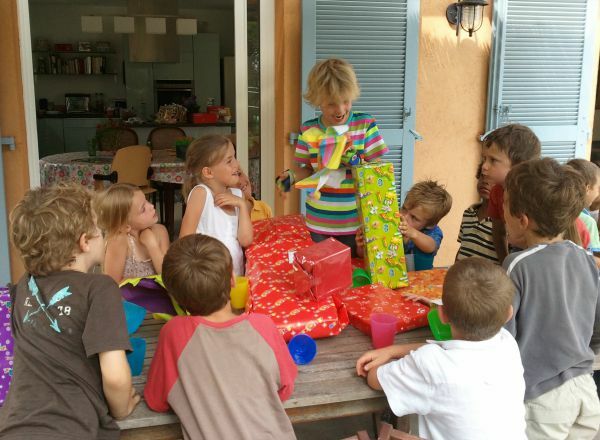 Off to Cannes area with my brothers and nieces and nephews soon, so very helpful. Yes it’s a great place to bring up kids, there’s so much to do, this is only the tip of the iceberg. 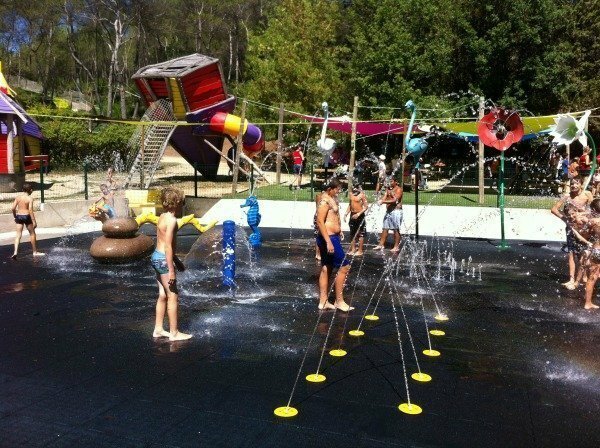 I love the idea that the kids strip off and head straight into the fountains (so bring a towel!). That is apparently so irresistible for all kids. 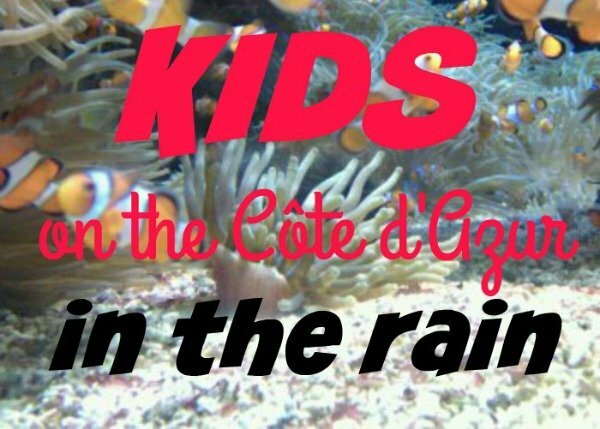 I had no idea that the Cotes D’Azure was so child friendly. Lucky you bringing up your boys there! April’s a great month, you’ll have a fab time! Thank you for the amazing information! 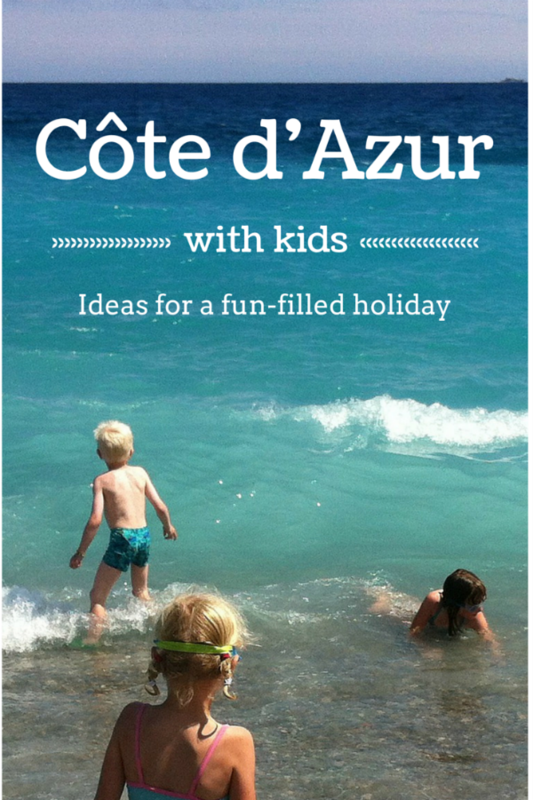 We are going to Cote d’Azur in April with our children! What a shame Priya! You’ll just have to come back, but thanks for stopping by all the same. A great roundup of fun activities with kids, wish I had seen these before our trip last summer! It sure is a fun museum! It’s hugely family-friendly these days Cathy, this is just the tip of the iceberg! 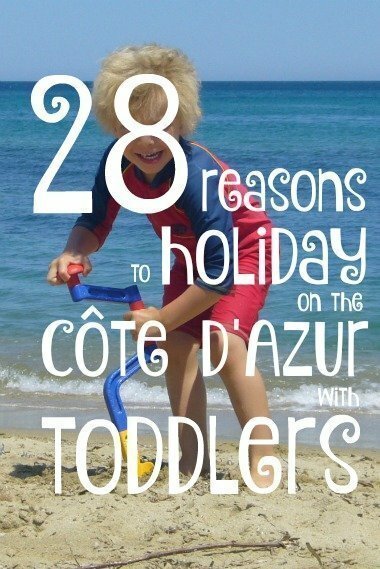 The Côte d’Azur ad Nice in particular has become much more family friendly than it used to be, nowadays it’s a great place for every age. Please do come and visit, it’s a great place! When are you booking you holiday to Lou Messugo Ting??? The oceanography museum looks so fun! And who doesn’t love a splash pad!? Super cool, thanks for sharing. I only visited the south of France as a child. I think we will need to visit soon this looks amazing! Sounds lovely! Your blog really does make me wish we could afford a visit soon! My daughter would love number 1 and searching for hidden fairies she is obsessed with them and has a woodland themed fairy garden bedroom! I’ve never been to the south of France, but I think I need to visit now! 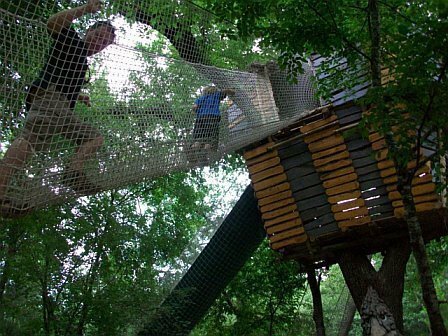 Le Bois des Lutins sounds like an amazing adventure playground and you have some amazing attractions nearby. My kids love all these things and are so lucky to live here. They don’t realise just how much though!! That’s great! And you know where to stay too don’t you???! Yes the Bois des Lutins is brilliant! Book yourself a holiday here at Lou Messugo then!! Simples! Your 3 year old would also adore the Bois des Lutins, it’s an amazing place. I can’t recommend it more! Enjoy your holiday! Wow, this looks and sounds absolutely amazing! I wish I could be transported there right now. It’s definitely going high up on my wish list. The Musée Océanographique is definitely one of my favourite places to visit with kids. I’m glad you enjoyed my post. Fabulous and comprehensive post. Who would have thought it was so kid friendly. I would LOVE to go back and do these fun things for the kids. Thank you for sharing, especially the Musée Océanographique de Monaco. 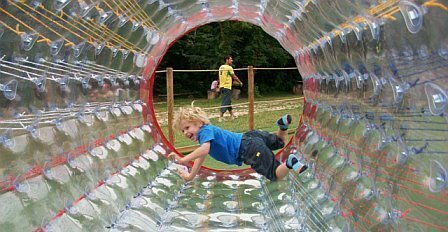 We’re lucky there are so many fun and original things to do in the area and I too love the 1st photo of my son in the “hamster wheel”!! We will definately have to revisit Les Bois eds Lutins and make our first trip to Labyfolies in May. If I read anymore of your blogs I will have to extend our stay to fit it all in – so exciting! The photo of Oscar on the ferry should be used as their advert – fantastic! Thanks for commenting Rachel. You’re right about les Nuits du Sud too, it’s a great way to take young children to their first concert. Yes to all of it – it’s surprising just how kid-friendly the region really is! The Nuits de Sud was also a huge hit with our kids, for those fortunate to visit the area during the summer concert season.